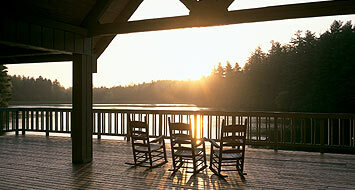 On 1,400 wooded acres, kanuga hosts some 35,000 guests annually. Episcopal affiliated, open to others, Kanuga offers comfortable lodging, delicious meals, complete meeting facilities, recreation choices (hiking trails, gym, athletic fields, tennis, fidhing, climbing tower, porch rockers, nearby golf and shopping). Inspiring natural beauty and a warm welcome await you. Exit 18 at Hendersonville To downtown. Cross Main Street. Next left on US 25 (Church Street) for 9 blocks. Right on Kanuga Street. 4 miles to triangular Kanuga Conferences sign on right. 1.5 miles to large Kanuga sign on right.